Installing Laravel is easy and few steps to follow and creating your own app is so easy too. Here I just give you very easy way to install laravel on your windows machine with Xampp (MySQL, PHP , Apache) Environment. First make sure that you have installed Xampp on your localhost. 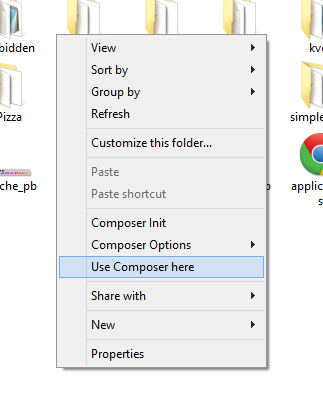 Than install composer to initiate setup. You can get windows composer from here. Than just download and install it. than you have the following things to start installing laravel. 1. Xampp installed on windows pc or lap. 2. composer downloaded and installed it. 3. Make sure your system connected to internet. 1. Open htdocs folder (C:/xampp/htdocs/ ). Than right click your mouse and there you will see some additional options as like shown in the following image. (Mine is windows 8). There click Use Composer here. It will initiate composer here. I mean a Dos-Command Prompt opens and path is already found in it, and type the following commant as like shown in the figure. Then it will start downloading laravel files from server. It appears like the following commants in it. Thats it. if you have any problem with it. drop your comment here. Previous Post PHP Login Page Example.